Provide comfort for the family of Patricia Mago with a meaningful gesture of sympathy. Patricia Ann Mago (nee: Beyers), 74, of Whiting, NJ passed away March 9, 2019. Visitations will be on Thursday, March 14, 2019 from 2-4pm and 7-9pm at the Mastapeter Funeral Home in Roselle Park, NJ. Patricia was born in Staten Island, New York on May 21, 1944. She graduated from Port Richmond High School and Wilfred Beauty Academy, where she ended up teaching for many year. She was active in the VFW of Middletown. Patricia was also a member of the First Aid Squad of Keansburg for many years. Patti Ann was never one to just sit around. 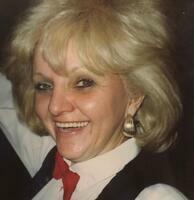 She was a bartender for many years, telling stories of her time at the BootLegger and then at Navesink Country Club. Recently she worked at the National Council on Aging. Patricia was predeceased by her parents, Donald and Theresa Beyers, and her daughter Karen Worthen. She is survived by two sons; Robert Sepulveda and wife Alison, and Michael Mago and wife Cindi. She is the cherished grandmother to five grandchildren - Jayde Worthen, Brewster Sepulveda, William Sepulveda, Gabriella Mago, and Vincent Mago. Patricia is also survived by her brother Vincent Beyers and wife Lisa, brother Gary Beyers Sr., brother Donald “JR” Beyers and wife Nancy, sister Donna Cacciatore, sister Theresa Beyers, and sister Angela Acconzo and husband Pat, as well as 15 nieces and nephews - Gary Jr, Christine, Valerie, Brenda, Bianca, Michael C., John, Rudy, Danielle, Joseph, Michael R., Stephen, Crystal, Heather, and Ashley. Patti Ann loved three things more than anything else - her grandchildren, DooWop music and her dog, Jack. She was always ‘going’, whether it was working, spending time with her grandkids, or taking Jack for walks. She was a one of a kind woman, and she will be missed by many. Jayde & The Hardwicks purchased the Rays of Light Spray for the family of Patricia Mago. My heart is heavy for the loss of my good friend and former co worker. I will miss our long conversations about our love of old R&B music, historians and her grand babies. her realness was one of a kind. Thank you Patti for being there when I needed an ear and a friend. My Prayers go to the family.